One last romp through the Rebels universe. The series has come to an end but fans get one last look back at this groundbreaking series. The success of Star Wars Rebels is due to the love and craftsmanship that goes into each episode. The cast is a wonderfully diverse group of people who add their charm and talent to this dynamic family. The behind-the-scenes crew continues to find new ways of improving the storytelling from episode to episode. And the leadership and guiding light of Dave Filoni has been remarkable. Dave is not only a fan of the franchise but has a deep understanding of what is Star Wars. Fans of Star Wars Rebels are going to be pleased by this newest Blu-Ray release. Not only is it filled with all the episodes of Season 4, but it also has all the Rebel Recon episodes released on YouTube for these episodes AND Dave Filoni does full audio commentary on six of them including “Jedi Night” (where Kanan dies) and the Series Finale. What’s even better about these commentaries is Dave extrapolates not only on the choices made per episode, but on the overall arc of all four seasons. He points out Easter eggs the team put into each story and talks about his vision for the show. One comment he made really stuck with me – “The path between dark and light isn’t just for Jedi alone.” He was speaking in reference to Sabine turning the weapon she created against the Empire and Tiber Saxon and how that moment was a defining one for her and Bo Katan. It’s insights like that you can expect from the Blu-Ray. The Blu-Ray also has three bonus features – “Ghosts of Legend,” “Force of Rebellion,” and “Kevin Kiner: The Rebel Symphony.” “Ghosts of Legend” is an in-depth look at each of the characters and their overall development over the course of the series and interviews not only Dave but the main cast and shares their stories and both how they affected and were affected by their characters and the other cast. It’s a nice feature that will surely give fans the warm fuzzies. 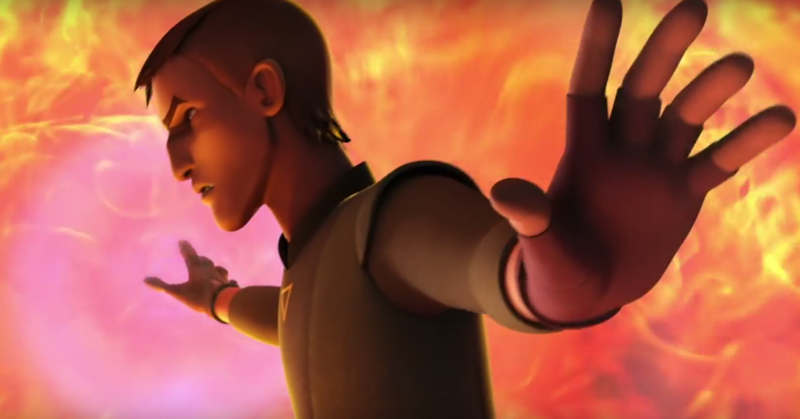 “Force of Rebellion” is a look at the use of the Force not only in Rebels but throughout the franchise. It focuses on the series, but with a broader look at the scope overall. “Kevin Kiner: The Rebel Symphony” is really interesting. It gave a behind-the-scenes dive into how the music is created and composed for the series, but what really interested me was the development of theme music for the characters and how those were created. The Season Four Blu-Ray is a fitting and well-done production and makes a worthy farewell to a beloved series. Star Wars Rebels Season Four will be released on July 31 on Amazon and retailers (both digital and physical) everywhere. Previous Previous post: The NEW Pixar Pier – Hit or Miss?